Love me a summer launch party, NYCRD! 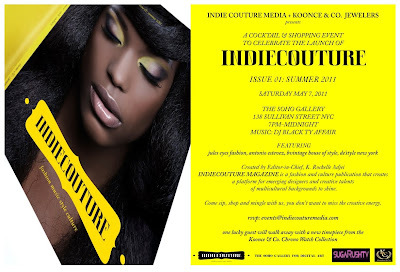 Celebrate the launch of Indie Couture NYC Magazine at The Soho Digital Gallery on Saturday May 7, from 7PM-12AM! Cocktails and shopping galore courtesy of Koonce Jewelers (www.kooncejewelers.com) and media partner Nichole Dossous of sugaRush TV. If you are looking for any trendy set of eyewear designed to protect you, strive a Ray Ban Wayfarer glasses. As you create your order as well as receive your current sun glasses, consider specific treatment ones. The best way to determine genuine RayBan sun glasses could be to head over to your dependable retail store to get the theifs to provide you with a few Ray Ban 3025 Aviators sun glasses.